FORT HOOD, Texas - The Fort Hood soldier who gunned down three other military men before killing himself had an argument with colleagues in his unit before opening fire, and investigators believe his mental condition was not the "direct precipitating factor" in the shooting, authorities said Friday. The base's commander, Lt. Gen. Mark Milley, offered those details a day after saying that Spc. Ivan Lopez's mental condition appeared to be an underlying factor in the attack. On Friday, Milley said that an "escalating argument" precipitated the assault. He declined to discuss the cause of the argument but said investigators believe Lopez made no effort to target specific soldiers - even though at least one of the soldiers shot was involved in the dispute. Milley would not say whether those involved were among the dead or wounded, or how many shooting victims had been a part of the argument. "There was no premeditated targeting of an individual," he said. Chris Grey, a spokesman for the Army's Criminal Investigation Command based in Quantico, Va., said the military has not established a "concrete motive." And because Lopez is dead, he added, "the possibility does exist that we may never know why the alleged shooter did what he did." The crime scene encompasses two city blocks, Grey said. Lopez initially began firing near an intersection, then traveled to several nearby buildings, went inside and kept firing. While driving to those locations in his vehicle, he fired indiscriminately at other soldiers, Grey said. Grey also confirmed for the first time that the military police officer who confronted Lopez exchanged words with him before firing a single round at him that apparently missed. That's when the gunman put his .45-caliber semi-automatic pistol against his head and pulled the trigger one last time. Authorities have interviewed more than 900 people in their investigation, Grey said. Also Friday, Lopez's father said his son had struggled with the recent deaths of his mother and grandfather and the stress of being transferred to a new base. Lopez's father, who shares the same name, said his son was receiving medical treatment but was a peaceful family man and a hard worker. "This is very painful for me," the elder Lopez said in the statement issued from his native Puerto Rico. He called for prayers for the dead and the 16 people who were wounded in the rampage. "My son could not have been in his right mind," Lopez said. "He was not like that." Wednesday's attack was the second at the base since 2009, when 13 people were killed by Army psychiatrist Nidal Hasan, who had said he was angry about being deployed to Afghanistan and wanted to protect Islamic and Taliban leaders from U.S. troops. Lopez, an Army truck driver, did a short stint in Iraq in 2011 and told medical personnel he had suffered a traumatic brain injury. The 34-year-old was undergoing treatment for depression and anxiety while being evaluated for post-traumatic stress disorder, base officials said. 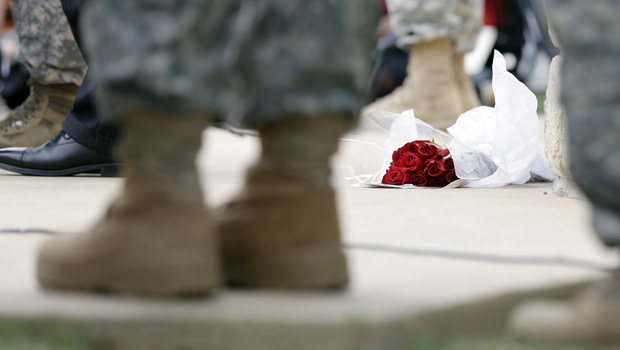 Does the Fort Hood shooter have a history of mental health issues? But officials said Lopez did not see any combat in Iraq and had not previously demonstrated a risk of violence. He seemed to have a clean record that showed no ties to potential terrorists. Lopez had arrived at Fort Hood in February Fort Bliss, another Texas base near the Mexico border. A family spokesman said Thursday that Lopez was upset he was granted only a 24-hour leave to attend his mother's funeral in November. That leave was then extended to two days. On Friday, authorities formally identified the dead as 39-year-old Daniel Ferguson, of Mulberry, Fla.; 38-year-old Carlos Lazaney-Rodriguez, of Puerto Rico; and 37-year-old Timothy Owens, of Effingham, Ill.
Six soldiers wounded in the attack remained hospitalized Friday. Ten of the 16 have been released, Milley said. Texas Gov. Rick Perry and Sen. Ted Cruz visited some of the wounded at a military hospital. Cruz said he was inspired by a soldier who had suffered a bullet wound to his abdomen, but still shielded other soldiers and called 911.